The University of Greenwich's vision for a large development in Stockwell Street goes on show today. The public exhibition of their plans for a new library and School of Architecture at the site, which was formely home to the Village Market, runs from today until Saturday at their Greenwich Campus. Full details of where to go and of the opening hours can be seen on a dedicated website about the project. 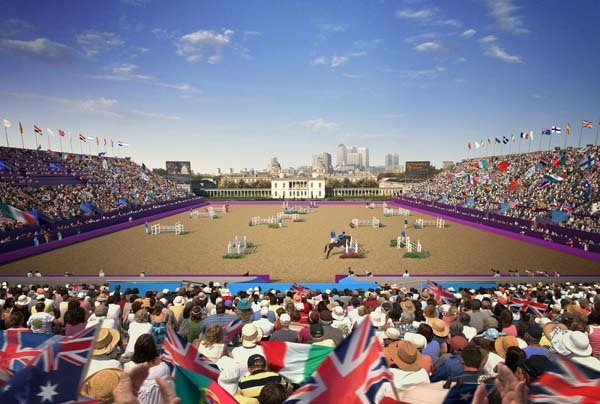 A batch of images was revealed last week which illustrate how key venues will look during the London 2012 Olympics. 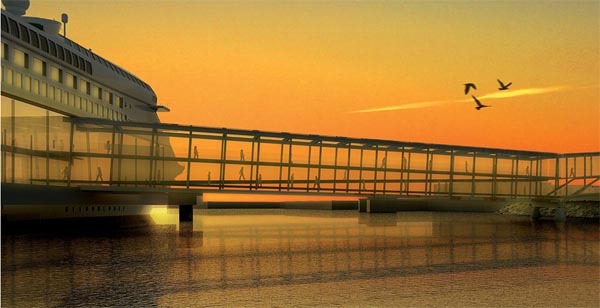 This artist's impression was carried out by Populous on behalf of the London 2012 organisers. Copyright belongs to Populous. The fate of the Thames Cable Car from North Greenwich to the Royal Docks has been left hanging in the air after a new safety review was ordered. Friends of the Earth campaigners have forced the move by claiming that the cable car would cross the Public Safety Zone for City Airport flights. The TFL scheme had already received the backing of Greenwich and Newham councils, but in response to safety concerns, London Mayor Boris Johnson has ordered a national air traffic services safety assessment, due to complete by March. More information can be found in Adam Bienkov's report for Snipe, and Darryl at 853 has more on the campaigners who have highlighted the issue. 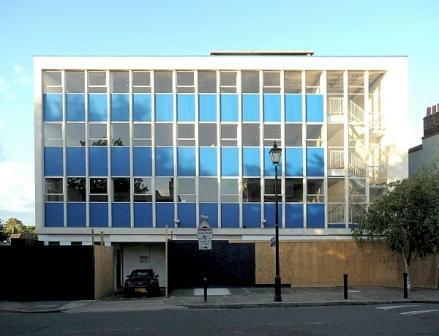 When I had an office in the annexe of John Humphries House in Stockwell Street, I never considered it to be a pleasant building, but the 60s office block which housed a local authority computer centre actually manages to look quite attractive in this lovely photo taken by Robert Carr. An application for the demolition of the building has been submitted as part of the University of Greenwich's redevelopment plans for the site. Find out more about their plans and the dates of their public exhibition on their dedicated webpage. Google's car was out and about in Greenwich on Saturday collecting new images for its Google Maps Street View feature - thanks to Alex Brooks for sharing this picture he took. 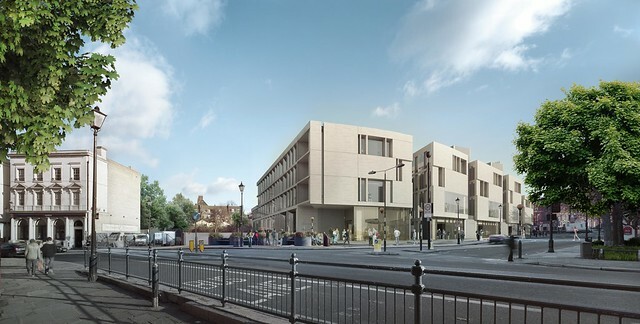 A planning application for a large development of new apartments, hotels and student accommodation at the corner of Greenwich High Road and Norman Road has been submitted. Proposals for the mixed use development, named The Movement, include 181 residential apartments, 358 student accommodation units, a 104 bedroom three star hotel and a 30 bedroom boutique hotel. The site of the proposed development is the Greenwich Industrial Estate which fronts onto Norman Road and is adjacent to the North Pole pub. The plans also include space for shops, a health club, a nursery, cafe and office space with a dedicated business start up area. The number of student accommodation units and residential apartments is less than was first suggested in the scoping report for this development that Greenwich.co.uk first reported on back in August 2010. The developer behind the proposal is Cathedral Group - the same developer that redeveloped Devonport House into a hotel and student accommodation and is working on the large "Deptford Project" regeneration. Six fire engines and 30 firefighters attended the blaze after after a call was made to the emergency services at 8pm. The occupants - two adults and one child - had already evacuated the two storey mid terrace property by the time firefighters arrived at the scene. The University of Greenwich has submitted its planning application for a new £76million development in Stockwell Street. The proposals, designed by Heneghan Peng, include a new campus library, a School of Architecture & Construction and other facilities such as TV studios and editing suites. 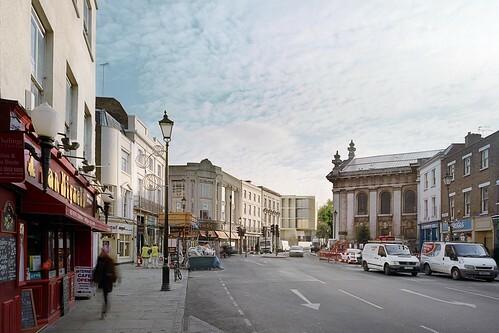 The new buildings, which would be bring up to 1,800 additional students into Greenwich each week, would restore Stockwell Street's traditional curved street line with "an elegant glazed frontage opening onto a gallery, café and exhibition space" which would all be available to the public. "Living roofs" have been incorporated, which the University says will create "a haven for wildlife in the centre of the town." 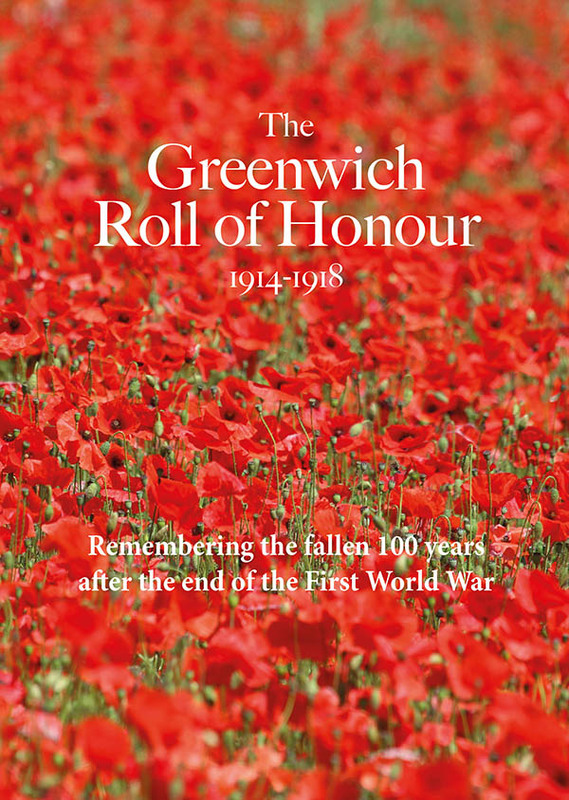 The university's Vice-Chancellor, Baroness Blackstone, says: "We hope that people in Greenwich will be as excited by these plans as we are. The high quality design of the new university building will greatly enhance the town centre. With some facilities and services open to local people and organisations, it will add to the creative and cultural energy of Greenwich and benefit our wider community." The former Village Market site had previously been ear-marked for a mixed use development but the University acquired the land last year. Most of the buildings have now been cleared although the 60s office block, John Humphries House, remains. The building was originally a pioneering purpose built computer centre, handling data processing for several Metropolitan boroughs. The initial designs were exhibited by the University at an eight day consultation last July. When asked if feedback received through the consultation event had resulted in changes to the scheme, a spokesperson told Greenwich.co.uk that there had been a "a reduction of the building mass; in height and stepping it back away from the neighbours gardens" and also a "a relocation of service facilities." Local residents and businesses will have another chance to examine the plans at a public exhibition from February 23rd to February 26 - click here for full details of times. A planning application for a cruise liner terminal, hundreds of new homes and a new hotel has been approved by Greenwich Council. The mixed use development will be built at the disused Enderby's Wharf adjacent to Christchurch Way on the south western side of the Greenwich Peninsula. In addition to 770 new homes and a 251 bedroom hotel, the 3.6 hectare site will also include shops, a creche and a gymnasium. The cruise ship terminal will have one cruise liner berth capable of accommodating ships up to 240m in length. There will also be two berths for Thames riverbus services. The land includes the Grade II listed Enderby House which was built in the mid 19th century. The property will be extended and converted into a restaurant "with accompanying exhibition and tourist" space. Once completed, 365 full time equivalent jobs are expected to be created and a "skills academy" will train 16 - 21 year olds for opportunities at the cruise terminal and hotel. The site itself was formerly owned by Alcatel Lucent - still based on adjacent land - and it was from here that the Enderby Brothers were pioneers in the development of telegraph cables that would be laid across the Atlantic. The proposals received the unanimous backing of councillors at last week's meeting of the council's Planning Board. “We are delighted that the Planning Boardhas decided to endorse the recommendation to approve the Enderby Wharf proposals. The collaborative approach to preparing the proposals over the past 18 months has resulted in a comprehensive mix of uses, which will bring a range of economic, environmental and social benefits to the borough and London as a whole. At the heart of the proposals is the provision of an international cruise liner terminal in the maritime heartland of Greenwich and London. The proposals have optimised the deep water within the River Thames to create a new tourist destination in a highly accessible location”. 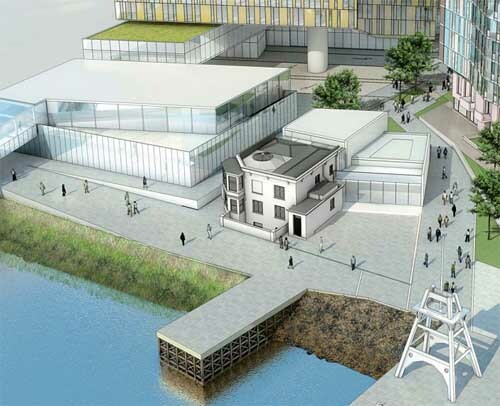 A cable car system across the Thames took a step closer to becoming a reality last night after it won the unanimous support of Greenwich Council's Planning Board. 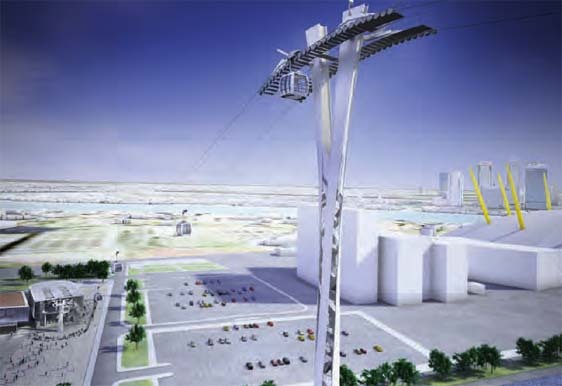 The TFL scheme to build a cable car linking the Greenwich Peninsula with the Royal Docks has already been backed by Newham Council. Once built, the Thames Cable Car will carry 34 gondolas - each with a capacity of 10 people - on the short journey fifty metres above the Thames. In their review of the scheme, CABE praised the "the elegance, inventiveness and originality" of the towers that will straddle both ends. For further coverage of the planning committee meeting, see Darryl's report at 853.